Increasing the volumetric energy densities of batteries is essential for improving the durability of portable electronics and the operating ranges of electric vehicles. One way to improve energy density is to enlarge the mass fraction of active materials in battery electrodes; however, the degree of enhancement remains limited. This limitation results from the densification of the electrodes when the mass fraction increases, making electron transport and ion diffusion throughout the electrodes sluggish. These drawbacks lower the utilization efficiency of the overall electrode materials. A team of scientists from China and the United States has recently addressed the aforementioned challenges. Specifically, they synthesized a 3D cathode of carbon-coated Li2MnSiO4 (Li2MnSiO4/C) with a structure mimicking a honeycomb filled with bee pupas (Fig. 1). This lithium-ion battery cathode possesses a high mass fraction of 90% (of overall electrode mass) as well as a volumetric energy density as high as 2443 Wh/dm3. 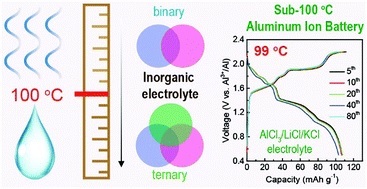 The uniquely structured electrodes were prepared through a hard-template method (Fig. 1). 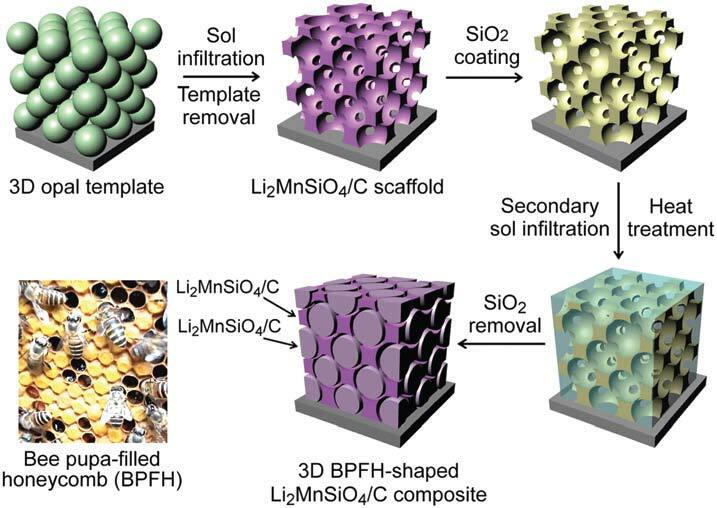 Using polystyrene particles, silica surface coating, and Li2MnSiO4 precursor infiltration, the authors synthesized a carbon-coated Li2MnSiO4 honeycomb scaffold with each cavity filled with a carbon-coated Li2MnSiO4 particle. This architecture differed from previously reported 3D structures, which typically had a large portion of voids, and enabled an ultrahigh active-material mass loading of 90 wt.%. 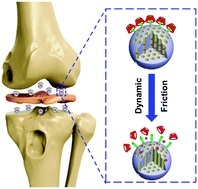 Additionally, the gaps between the scaffold and the particles functioned as ion-diffusion channels, and the carbon coatings served as electron-transport expressways. These characteristics effectively addressed the problem of sluggish ion diffusion and electron transport. Figure 1. The synthesis procedures of the BPFH-shaped Li2MnSiO4/C electrode. The green particles and yellow scaffold represent polystyrene spheres and the silica coating, respectively. Due to the facilitated electron transport and ion diffusion, the Li2MnSiO4/C electrode with a bee pupa-filled honeycomb (BPFH) structure (Fig. 2a) exhibited an outstanding charge-storage performance. Specifically, it delivered a high volumetric capacity of 643 mAh/cm3 at a current density of 0.1 C, corresponding to a volumetric density of 2443 Wh/dm3. This volumetric capacity was approximately two times higher than that of a Li2MnSiO4/C honeycomb lattice without any Li2MnSiO4 particles (Fig. 2b). After 100 consecutive charge-discharge cycles, the BPFH-shaped Li2MnSiO4/C electrode retained a volumetric capacity of 328 mAh/cm3 (Fig. 2c). Figure 2. (a and b) Scanning electron microscopy images of (a) the BPFH-shaped Li2MnSiO4/C electrode and (b) the Li2MnSiO4/C scaffold. (c) The capacities and the Coulombic efficiencies of the two electrodes during 100 charge-discharge cycles. The demonstrated BPFH architecture could be extended to other materials for the synthesis of battery electrodes with both high mass fractions of active materials and outstanding volumetric energy densities. Tianyu Liu obtained his Ph.D. (2017) in Chemistry from University of California, Santa Cruz in the United States. He is passionate about scientific communication to introduce cutting-edge research to both the general public and scientists with diverse research expertise. He is a blog writer for Chem. Commun. and Chem. Sci. 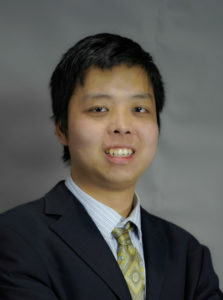 More information about him can be found at http://liutianyuresearch.weebly.com/. All of the referee-recommended articles below are free to access until Monday 1st April. Organic compounds with conjugated electron structures are emerging as promising Li-ion battery cathodes due to their high capacity and environmental benignity. To make these cathodes practically feasible, organic electrodes are typically incorporated with metal ions to boost their energy densities. The addition of metal ions, however, usually jeopardizes the structural integrity of the electrodes and shortens battery lifetime. Recently, three groups of Chinese researchers demonstrated that increasing the electrolyte concentration could effectively prolong the lifespan of metal-incorporated organic cathodes. The researchers studied cuprous tetracyano-quinodimethane (CuTCNQ), a Cu2+-containing organic Li-ion battery cathode, and observed its significantly improved cycling stability in a 7 M LiClO4 electrolyte compared to a 1 M electrolyte. This work was published recently in ChemComm. CuTCNQ in a typical diluted electrolyte of 1 M LiClO4 exhibited unsatisfactory stability. Its first-cycle charging capacity reached ~180 mAh/g, but it dropped appreciably to 23 mAh/g after the first discharging process (Figure 1a). Concurrently, the electrolyte turned from clear to yellow (Figure 1b), due to the dissolution of TCNQ. These observations unequivocally showed the rapid disintegration of CuTCNQ in diluted electrolytes. Figure 1. (a) The first-cycle charge-discharge profile of CuTCNQ in a liquid electrolyte containing ethylene carbonate (EC), propylene carbonate (PC) and 1 M LiClO4 (1 M LiClO4-EC/PC). (b) Photographs showing the electrolyte color before and after the first charge-discharge cycle. CuTCNQ was found to be more stable in electrolytes with concentrations higher than 1 M. When the LiClO4 concentration increased to 3 M, 5 M and 7 M, the specific capacities of CuTCNQ retained after 50 consecutive charge-discharge cycles were ~25 mAh/g, ~70 mAh/g, and ~110 mAh/g, respectively (Figure 2a). All of these capacities were higher than that of CuTCNQ in 1 M LiClO4 after the same cycle number (<10 mAh/g). Additionally, the electrolytes experienced nearly no color change, suggesting little TCNQ was dissolved (Figure 2b). The elevated stability of CuTCNQ correlates to the formation of Li+-ClO4– ion pairs in concentrated electrolytes (Figure 2c). With increasing LiClO4 concentration, Li+ and ClO4– tend to form ion pairs that coordinate with solvent molecules. Solvent-coordination reduces the number of free solvent molecules that can dissolve TCNQ, thus minimizing the dissolution of TCNQ. Figure 2. (a) The cycling stability performances of CuTCNQ with electrolytes with different LiClO4 concentrations. (b) Photographs showing the electrolyte color before and after 50 charge-discharge cycles at different LiClO4 concentrations. (c) Li+ and ClO4- form solvent-coordinated ion pairs in super-concentrated electrolytes (e.g., 7 M). This work provides a facile approach to mitigate the capacity fading of CuTCNQ. The strategy may be extended to stabilize other metal-incorporated organic cathodes in Li-ion batteries. All of the referee-recommended articles below are free to access until Friday 18th January. 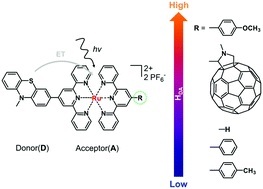 Naphthalene and perylene diimides – better alternatives to fullerenes for organic electronics? Hydrogen gas is a zero-emission energy resource promising to replace diminishing fossil fuels. The electrolysis of water is a sustainable way to acquire hydrogen gas, but this non-spontaneous process demands electricity to proceed. Therefore, hydrogen evolution reaction (HER) catalysts are used to reduce the energy cost or overpotential of the electrolysis. Researchers are pursuing ultrafine nanoparticles as HER catalysts due to their high catalytic activity. For example, the HER catalytic activities of Ru nanoparticles are reportedly 100-200% higher than those of bulk Ru catalysts. Unfortunately, the preparation of well-dispersed nanoparticles is challenging because nanoparticles are prone to aggregate together. Recently in ChemComm, Fuqiang Chu, Yong Qin and coworkers from Changzhou University, China addressed the challenge. They utilized a Ru-based coordination complex and cyanuric acid as the reactants, and synthesized high-performance HER catalysts composed of ~2 nm Ru nanoparticles uniformly dispersed on graphene sheets. During the thermal annealing step in the synthesis, the ligands of the complex and the cyanuric acid both decompose to nitrogen-doped carbon shells covering the as-formed Ru nanoparticles. These shells serve as spacers that prevent particle aggregation (Figure 1). Figure 1. An illustration of the synthesis of carbon-coated Ru ultrafine nanoparticles on graphene sheets. Tris(2,2′-bipyrindine) ruthenium dichloride is the precursor of the Ru nanoparticles. In both the acidic and the alkaline electrolytes, the 2 nm Ru particles (RuNC-2) display lower overpotentials and higher current densities than the 5 nm Ru particles (Figure 2) without the carbon coating (RuNC-5). Remarkably, the 2 nm particles showed comparable performance to the benchmark Pt catalyst in the acidic electrolyte (the red and black curves in Figure 2a). Figure 2. Linear sweep voltammograms of ~3 nm Pt nanoparticles (PtNC), 2 nm Ru nanoparticles (RuNC-2) and 5 nm Ru nanoparticles (RuNC-5) in (a) 0.5 M H2SO4 and (b) 1 M KOH aqueous solutions. The concept of the in-situ generation of protective coatings could inspire the synthesis of other ultra-small nanoparticles to potentially push the HER catalytic performance to new heights. A MOC, I learned this week, is a metal-organic cage. I was familiar with MOMs, MOFs and MOBs, but MOCs were a new one. A MOM (metal-organic material) is a coordination-driven assembly constructed from metal nodes linked by organic ligands. MOMs encompass both MOFs (metal-organic frameworks) and MOCs (metal-organic cages). A MOF is an extended network with the potential for inner porosity, and a MOC is a discrete metal-ligand cluster. And that’s just about as far down the nomenclature rabbit hole I’m willing to go. If you’re keeping up you’ll realise that I forgot one! A MOB is a crowd of graduate students competing for free coffee at the public seminar. Dong and co-workers at Shandong Normal University designed and prepared a MOM catalyst constructed from copper(II) nodes and a tripodal ligand consisting of a phenylic wheel functionalised with diketones. In chloroform these two components arrange into discrete MOC assemblies containing two tripodal ligands and three copper ions. The copper ions in the cluster are each coordinated to two diketone moieties (in a acetylacetonate-like fashion) in a quasi-square planar arrangement. Synthesis of the tripodal ligand functionalised with diketone coordinating moieties. An interesting property of the material is that it can switch between the MOC form, soluble in halogenated solvents, and an insoluble MOF that assembles upon addition of 1,4-dioxane. 1,4-Dioxane is both an anti-solvent and a ligand; coordination between copper and 1,4-dioxane binds the discrete MOC cages to each other, arranging them into the extended MOF structure. This behaviour can be exploited to prepare a practical catalyst that combines the benefits of both homogeneous and heterogeneous catalysis, namely that homogeneous catalysts are generally more efficient, selective and easier to study, but heterogeneous catalysis are easier to recover and recycle. What better way to solve this problem than with a catalyst that is homogeneous during the reaction conditions, but heterogeneous when it comes to product separation? Reversible MOC(top left)-MOF(top right) transition mediated by the addition of 1,4-dioxane. Coordination bonds between 1,4-dioxane shown (bottom image). The authors used the A3 coupling reaction to demonstrate this concept in a catalytic reaction. The A3 reaction is a transition metal-catalysed, multi-component coupling reaction between aldehydes, alkynes and amines. The products are propargylamines, practical synthetic intermediates for the synthesis of nitrogen heterocycles. The A3 reaction has been extensively studied and can be effected by a wide range of transition metal catalysts. 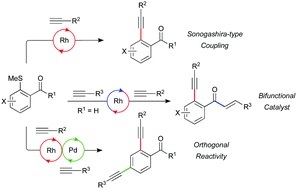 Its versatility makes it a popular choice as a model catalytic reaction to demonstrate innovative ideas in catalytic design – as the authors have done here. Coordination-driven assemblies have a unique potential for the synthesis of differentially soluble materials, used by the authors for novel catalytic design. Whether this particular metal-ligand combination can be applied to other copper catalysed reactions remains to be seen, nevertheless the principle offers an innovative approach that augments the range of methods striving to bridge the gap between homogeneous and heterogeneous catalysis. Gong-Jun Chen, Chao-Qun Chen, Xue-Tian Li, Hui-Chao Ma and Yu-Bin Dong. Zoë Hearne is a PhD candidate in chemistry at McGill University in Montréal, Canada, under the supervision of Professor Chao-Jun Li. She hails from Canberra, Australia, where she completed her undergraduate degree. 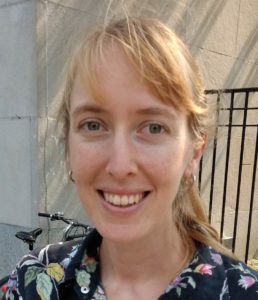 Her current research focuses on transition metal catalysis to effect novel transformations, and out of the lab she is an enthusiastic chemistry tutor and science communicator. Metal organic frameworks (MOFs) are crystalline nanomaterials composed of metal ions or clusters coordinated with organic ligands. Owing to the versatility of their building blocks, MOFs have multiple functionalities and can serve as gas separators, sensors, catalysts, electrode materials etc. Now the structure diversity of MOFs is further enriched by Wu and coworkers from Soochow University, China. Specifically, the researchers synthesized a semiconducting MOF with tetra-coordinated sulfur units. This breakthrough was recently published in ChemComm. The uniqueness of the synthesized semiconducting MOF (MCOF-89) is its square-planar tetra-coordinated metal-sulfur structure, which is observed in MOFs for the first time. It was believed that putting a sulfur atom next to a metal node of MOFs was extremely difficult, because of the large discrepancy in bonding energy between metal-sulfur bonds and conventional metal-carboxylate bonds. Incorporating sulfur atoms thereby could undermine the structural stability of MOFs. The authors addressed this challenge by designing a tetra-coordination environment as illustrated in Figure 1. The four manganese-sulfur bonds effectively reinforced the unstable S coordination. MCOF-89 was synthesized via a solvothermal reaction with Mn(CH3COO)2 and thiourea as the Mn and S sources, respectively. Figure 1. The structure of MCOF-89. 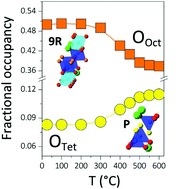 The illustration on the left is a three-dimensional lattice structure (the red, green and yellow balls represent oxygen, manganese and sulfur), and the structure on the right shows the Mn-S square-planar tetra-coordination configuration (M = manganese). The synthesized S-incorporated MOF is a semiconductor with a bandgap of 2.82 eV. Additionally, this MOF is photoactive and is able to generate a photocurrent of ~1.9 µA/cm2 upon light irradiation. This work exemplifies how molecular design can lead to the discovery of novel MOFs with extraordinary structures. It could also inspire other synthesis protocols toward various metal-chalcogenide-containing MOFs with unexpected properties. How do Anions Fight Indoor Organic Contaminants? Indoor air quality is critical to public health. Chronic exposure to indoor organic contaminants (IOCs), including aldehydes and benzene homologues, substantially increases the risk of having respiratory diseases. In recent years, negative air ions (NAIs) have emerged as promising materials to decompose IOCs. NAIs are negatively charged ions generated via ionizing air. However, the limited understanding of the decomposition reaction mechanisms hinders the safety evaluation and wide adoption of NAI-cleaning. A group of Chinese researchers led by Jin-Ming Lin of Tsinghua University recently demonstrated in ChemComm a powerful tool to unveil the reaction mechanisms. 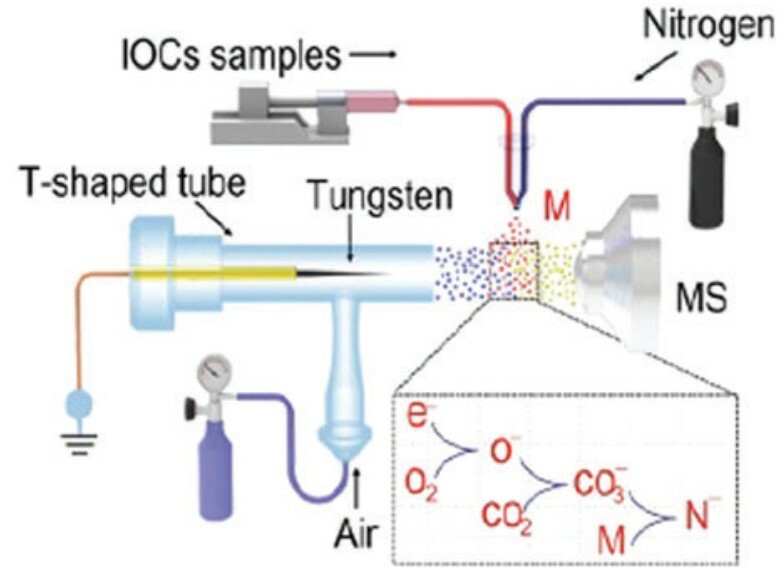 They built a system integrated with an NAI generator, an IOC sprayer and a mass spectrometer (Figure 1). NAIs containing mostly CO3– were produced by the ionization of air. These anions then mixed and reacted with the sprayer-delivered IOCs in front of the mass spectrometer inlet. All species generated during the reactions were directly brought into the mass spectrometer by inert N2 for characterization. Figure 1. The experimental set-up of the integrated system. This device revealed real-time reaction kinetics by identifying the reaction intermediates. The mass spectrum of a common IOC, formaldehyde, when reacted with CO3– is presented in Figure 2a. Two pronounced peaks with mass to charge ratios (m/z) of 45.10 and 60.10 were assigned to HCOO– and CO3–, respectively. Additionally, the 45.10 peak was only detected when formaldehyde was present (Figure 2b). On the basis of these observations, the authors concluded that the major pathway of formaldehyde degradation by CO3– was the reaction between CO3– and the α-H atom of the aldehyde group. With identical instrumentation, the authors also proposed how the reactions between CO3– and benzene homologues or esters may proceed. Figure 2. (a) The mass spectrum of reaction intermediates between CO3– and 10 ppm formaldehyde. (b) The change of peak intensities of m/z = 60.10 and 45.10 peaks with the operation time. Formaldehyde was present during 7.0-14.0 min. The results obtained by this study could greatly deepen the understanding of NAI-based chemistry. It could also be useful to investigate kinetics of a broad range of other chemical reactions involving charged reactants. 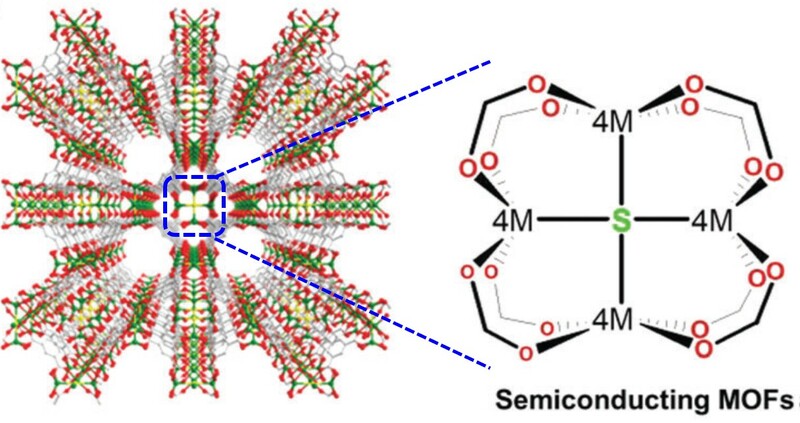 Mohamed Eddaoudi and co-workers at KAUST have synthesised a porous metal organic framework (MOF) constructed from carboxylic acid-functionalised imidazole linkers coordinated to yttrium and potassium cations. The researchers classified this material as a zeolite-like MOF (ZMOF) due to its topological resemblance to the naturally occurring zeolite mineral analcime. The material’s architecture, with cylindrical channels and a pore aperture measuring 3.8 x 6.2 Å, promised utility as a molecular sieve, and the authors showed the ZMOF could be used to sort small chain alkanes based on their level of branching. Linear and mono-branched pentanes and butanes were adsorbed by the material for different lengths of time (linear isomers were retained longer than their branched counterparts) allowing kinetic separation, while the di-branched alkane 2,2,4-trimethylpentane was excluded entirely. The authors anticipate that this material could have practical applications in crude oil refining, to upgrade petroleum into more energy-efficient fuels with reduced emissions. ZMOF crystal structure with analcime (ana) topology showing channels and pore aperture. The petroleum used to power internal combustion engines consists of a mixture of low molecular weight, linear and branched alkanes. The research octane number (RON) is a standard measure of petroleum performance, and indicates how much pressure a fuel can withstand before self-igniting (knocking) in the engine. High compression engines, which are more energy efficient and release less emissions than regular engines, require high RON fuels. The RON increases with the proportion of branched alkanes, so can be improved by supplementing fuels with branched isomers obtained by catalytic isomerisation. This process generates a mixture of linear and branched alkanes, so the desired products must be isolated via fractional distillation, which is energy intensive. This creates a dilemma: high RON fuels are more energy efficient, but their energy-intensive production reduces the net benefit. The authors envisaged an energy-efficient strategy for increasing the RON of petroleum fuels: A low RON fuel is pumped into the engine, where it encounters a separation chamber consisting of ZMOF-based membranes. The membrane excludes and redirects di-branched alkanes, which have a very high RON, to the internal combustion engine. The low RON fraction, consisting of mono-branched and linear alkanes, passes through the ZMOF pores to undergo further reforming processes downstream. In other words: low RON fuels go in, but high RON fuels are combusted. In this work the authors show the potential of ZMOFs to maximise the energetic potential and reduce emissions of petroleum based fuels, while also offering a glimpse of the more general strategy of energy-efficient separations of chemically-similar molecules using tailored materials. M. Infas H. Mohideen, Youssef Belmabkhout, Prashant M. Bhatt, Aleksander Shkurenko, Zhijie Chen, Karim Adil, Mohamed Eddaoudi. Xenon (Xe) is a noble gas that is widely used in lighting industry and medical imaging. Due to its trace amount in air and the energy-consuming, labor-intensive manufacturing process, Xe has a market price approximately 100 times higher than nitrogen gas (N2). Therefore, recycling Xe is practically necessary and economically appealing. Recently in ChemComm, scientists from Colorado School of Mines (U.S.) and Pacific Northwest National Laboratory (U.S.) demonstrated an effective method to recover Xe from Xe/air mixtures. The key material this approach needs is a thin piece of film made of a microporous crystalline metal organic framework (MOF)—ZIF-8 (zeolite imidazole framework-8). The unique porous structure of ZIF-8 renders it capable of separating Xe from N2 and O2. 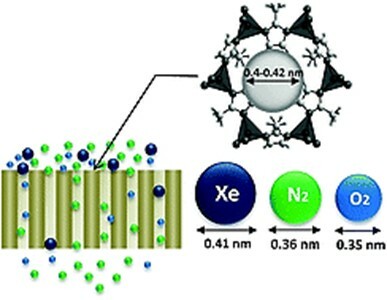 The pore size of ZIF-8 is in the range of 0.4-0.42 nm, and the sizes of Xe, N2 and O2 molecules are 0.41 nm, ~0.36 nm and ~0.35 nm, respectively. When Xe/air mixtures are pushed towards a ZIF-8 film, the small N2 and O2 molecules are able to permeate the film while the relatively large Xe molecules are blocked. This results in the separation of Xe from N2/O2. The ZIF-8 film in this case serves as a gas sieve (Figure 1). Figure 1. A ZIF-8 MOF film functions as a molecular sieve that separates Xe from N2 and O2. The pores of ZIF-8 are large enough to pass through N2 and O2 molecules but are too small for Xe to enter. The mechanism mentioned above was experimentally verified. The researchers observed that the flow rate of air through a ~10 µm ZIF-8 film was almost 10 times higher than that of Xe. In addition, reducing the film thickness and lowering the temperature were found to enhance the separation efficiency. This work clearly demonstrates the promising performance of ZIF-8 for gas separation. It also highlights the versatile functionalities of MOFs.